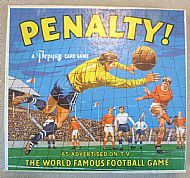 An all time classic from Pepys Games. 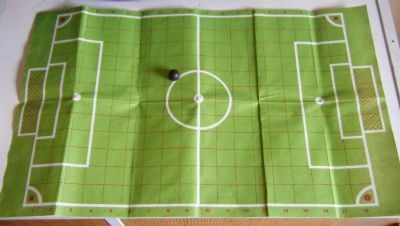 Simple and amazingly realistic considering it is simply a pitch, ball and some cards. 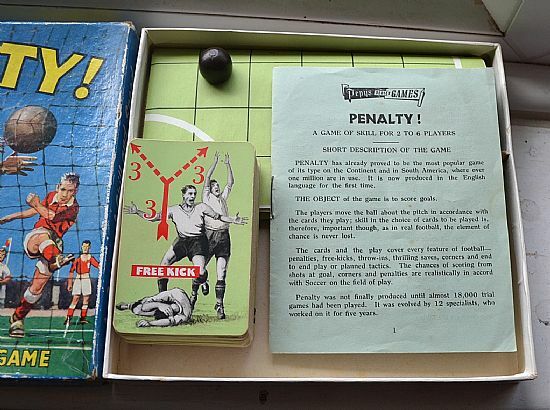 Each player is dealt 5 cards and can use them to move the ball, save a shot or claim a penalty. Brilliant! Loads of versions to collect. Definitely four different sets, probably more. Buy all four different boxed sets for £100 including postage. 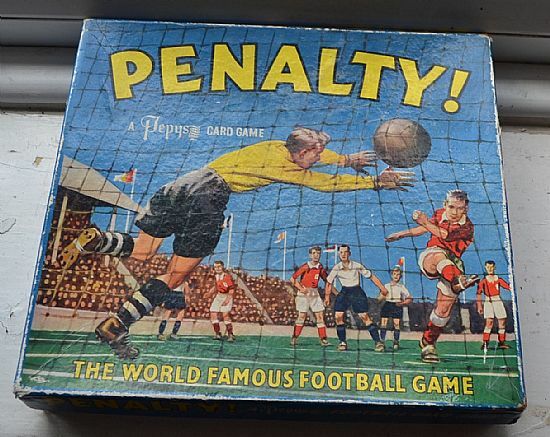 Classic football action, this is the very rare first edition game complete and in good condition. 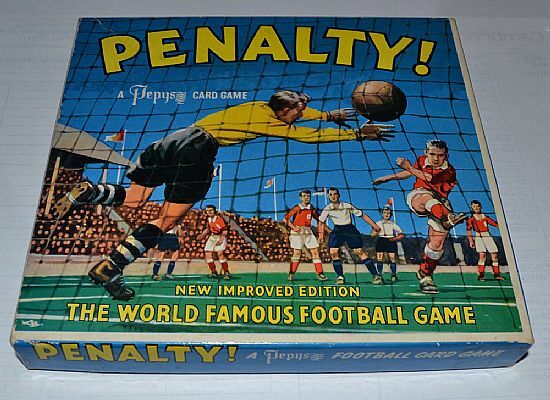 This is a great condition second 'new improved edition' of Penalty. 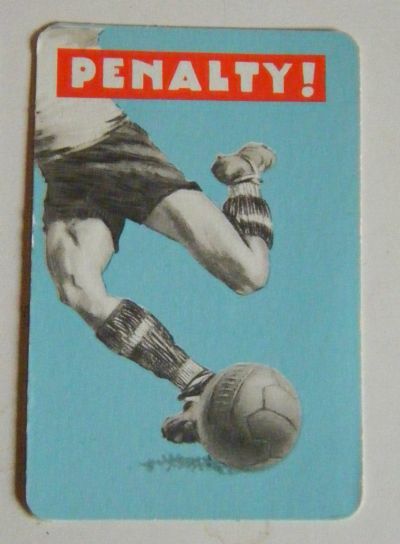 Complete and in good condition, sharper printing. Blue coloured cards and a different instruction leaflet.Keeper still in black kit, lid now has a white border. How to spot a rare first edition. There are five giveaway signs of a first edition. 1. 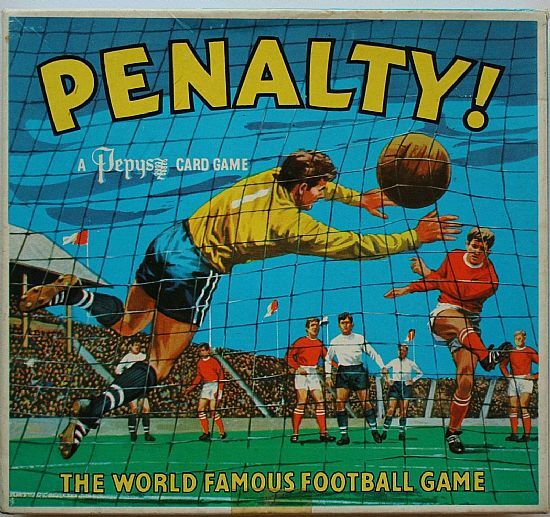 Black shorts and old fashioned boots on the goalkeeper on the box lid. 2. No white border around the box lid image. 4. Greeny/blue paper for the instruction leaflet that has a different intro sentence (two versions of this). 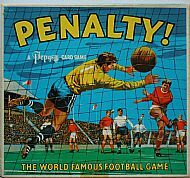 The 3rd edition of the Penalty game. Box illustration is updated with blue keeper kit and newer hairstyles. No sub-line on the box. 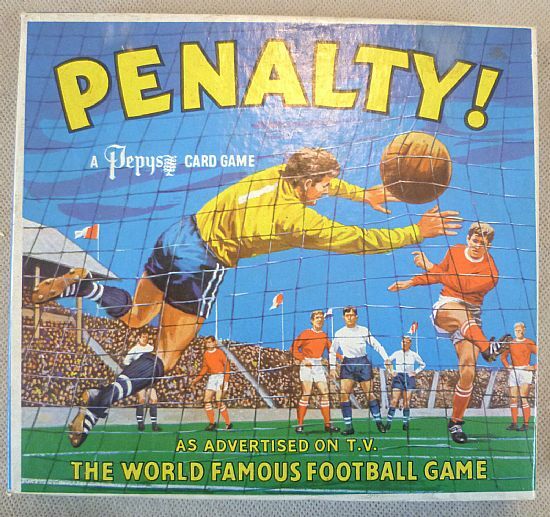 A 4th edition box design, this one promoting the game 'as advertised on TV' no less! 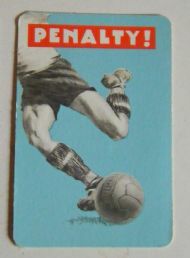 Blue shorts goalkeeper image. 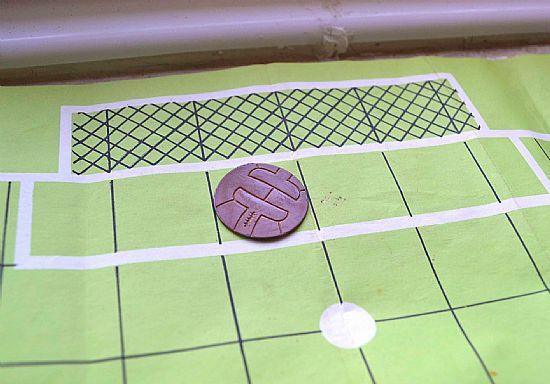 Nice simple paper pitch with gridlines and a lovely wooden ball. A selection of the various cards used in the game. 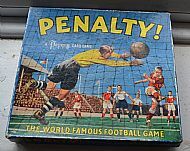 The very first editions had a flat penny-like football marker. Quickly replaced by the classic round wooden ball with flat base.